VOLUNTEERS from area chapter of National Women In Roofing stand in front of Alexandria House before their work begins. Left to right: Michelle Betancourt, Christi Bravo, Maria Alcala, Linda Foster, Carissa Santos, Careylyn Clifford and Camilla Adams. When a roofing job was needed at Alexandria House, a transitional residence for single women and their children, the men and women of Supreme Roofing, L.A. Roofing Materials, and the National Women in Roofing (NWiR) organization stepped in to do the job. “Nobody thinks about a roof, so that’s where we come in!” says Careylyn Clifford, controller and manager at Supreme Roofing and a member of NWiR. National Women in Roofing is a volunteer organization that provides networking, recruiting, mentoring and education for women roofing professionals. The Southern California chapter of NWiR was searching for a local battered women’s shelter to which they could donate their services. Clifford, a Hancock Park native, suggested the Alexandria House project to Doug Ratliff, owner of Supreme Roofing, and he jumped on board. Together with Steve Gardner’s L.A. Roofing Materials, the two companies joined forces on Nov. 2 to provide roof repair and free labor, worth $7,000, to the aging rooftops of Alexandria House. They also re-roofed a playhouse on the property to give the residence’s children a safe and dry place to play. “It’s important to stay connected with the community,” says Steve Gardner of the project. Located on Alexandria Avenue near Fourth St., 200 families have moved through Alexandria House’s early 20th-century homes for the past 20 years as they transition from homelessness and abuse to jobs, education and a future. Alexandria House does not receive federal funding, so it sustains itself through partnerships and community support. 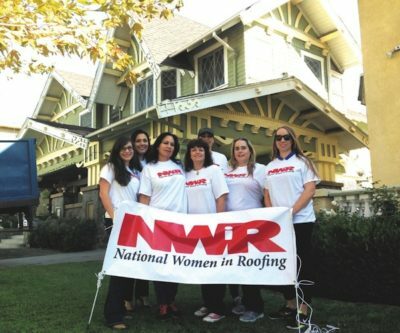 Maria Alcala, NWiR member and customer service and sales manager for L.A. Roofing Materials, was more than happy to help the battered women’s community. It is a station in life she knows all too well. The repair team consisted of Doug Ratliff, Steve Gardner, NWiR members Michelle Betancourt, Christi Bravo, Maria Alcala, Linda Foster, Carissa Santos, Careylyn Clifford, Camilla Adams and a repair crew, all donating their time and energy to the project. The team of workers spent the day repairing and replacing dilapidated roof shingles, leaky corners and shabby, worn-out roofing materials on both the house and the garage. Inside the house, they installed a new solar fan to make the third floor cooler. The children’s playhouse was also on the docket. Upon closer examination, the workers realized that the playhouse had originally been covered in wood shingles, so they replaced the damaged asphalt-shingled roof with a new wood shingle that harkens back to the original. While working, the team noticed that the wooden subfloor of the playhouse suffered from major termite damage, so they repaired and replaced that as well. In addition to the roof repairs, the women of NWiR provided a hot barbeque lunch for the volunteers and residents and filled the home with donated items such as toilet paper, baby wipes, dish soap, laundry soap, and other much-needed supplies. The mood was jovial and everyone was delighted to pitch in on such an important project. “The bottom line is that we are creating a community here,” says Vaughan. Happily, it will be a community that is warm and dry this winter. Tags: Alexandria House, L.A. Roofing Materials, National Women in Roofing, NWiR, Supreme Roofing Co.